I vividly recall each of my children learning how to walk. Their adorable faces, cubby legs and tentative little feet as they stepped out on their own for the first time. Each one was so determined to keep going. The independence was fine within the safe parameters of home, but walking outside or in public places was another story. However, as a parent I knew I couldn’t continue to carry them everywhere through adulthood, so I had to let them try. I was holding their hand and right beside them every step of the way. 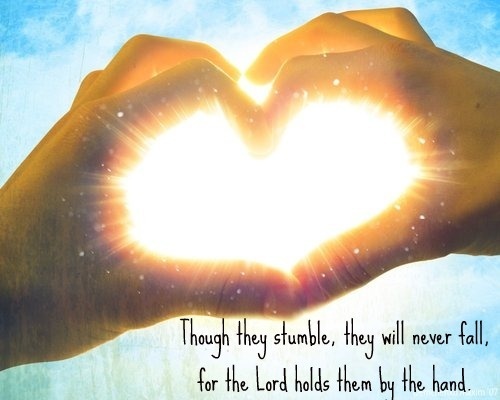 If they happened to stumble, I was there to lift them up, hold them close and wipe their tears. Then, they were ready to try again. It is not any surprise that things will come into our lives at times and trip us up. I personally was thrown for a loop a little over a year ago when the doctor said, “it’s cancer.” I started to worry about the future, my family and what this would mean for my life. I stumbled – looking for answers and solutions on my own instead of immediately turning to the arms of God. However, He did not let me fall. I reached out to Him and He lifted me up. Spend time with God in prayer today and ask forgiveness for the times you’ve stumbled. Then praise Him for reaching out and keeping you from falling. Jamy, love that song and the beautiful Scripture verses that remind me I am never alone and to ask forgiveness from my merciful Father…Jesus I trust in you!